Angélique Kpasseloko Hinto Hounsinou Kandjo Manta Zogbin Kidjo, known as Angélique Kidjo (born July 14, 1960), is a Beninese singer-songwriter, actress, and activist who is noted for her diverse musical influences and creative music videos. Time magazine has called her "Africa's premier diva". The BBC has included Kidjo in its list of the African continent's 50 most iconic figures. The Guardian has listed her as one of its Top 100 Most Inspiring Women in the World and Kidjo is the first woman to be listed among "The 40 Most Powerful Celebrities in Africa" by Forbes magazine. The Daily Telegraph in London described her as "The undisputed queen of African music" during the 2012 Olympic Games River of Music Festival. In March 2013, National Public Radio (NPR) in America, called her "Africa's greatest living diva". Kidjo is listed among the "2014 Most Influential Africans" by New African magazine and Jeune Afrique. Forbes Afrique put Kidjo on the cover of their "100 most influential women" issue in 2015. On June 6, 2013, Kidjo was elected vice-president of the Confédération Internationale des Sociétés d´Auteurs et Compositeurs (CISAC). She now resides in New York City, where she is an occasional contributor to The New York Times. Kidjo has received Honorary Doctorates from Yale University, Berklee College of Music and Middlebury College. She is the 2018 Harvard University Jazz Master In Residence. Her musical influences include the Afropop, Caribbean zouk, Congolese rumba, jazz, gospel, and Latin styles; as well as her childhood idols Bella Bellow, James Brown, Nina Simone, Aretha Franklin, Jimi Hendrix, Miriam Makeba and Carlos Santana. She has recorded George Gershwin's "Summertime", Ravel's Boléro, Jimi Hendrix's "Voodoo Child" and the Rolling Stones' "Gimme Shelter", and has collaborated with Dave Matthews and the Dave Matthews Band, Kelly Price, Alicia Keys, Branford Marsalis, Ziggy Marley, Philip Glass, Peter Gabriel, Bono, Carlos Santana, John Legend, Herbie Hancock, Josh Groban, Dr John, the Kronos Quartet and Cassandra Wilson. Kidjo's hit songs include "Agolo", "We We", "Adouma", "Wombo Lombo", "Afirika", "Batonga", and her version of "Malaika". Her album Logozo is ranked number 37 in the Greatest Dance Albums of All Time list compiled by Vice magazine's Thump website. Kidjo is fluent in five languages: Fon, French, Yorùbá, Gen (Mina), and English. She sings in all of them, and she also has her own personal language, which includes words that serve as song titles such as "Batonga". "Malaika" is a song sung in the Swahili language. Kidjo often uses Benin's traditional Zilin vocal technique and vocalese. Kidjo is the recipient of the 2015 Crystal Award given by the World Economic Forum of Davos in Switzerland and has received the Ambassador Of Conscience Award from Amnesty International in 2016  She also is included in the exhibits at the National Museum of African American History that opened on Sept. 24, 2016 on the National Mall. Kidjo was born in Ouidah, Benin. Her father is from the Fon people of Ouidah and her mother from the Yoruba people. She grew up listening to Beninese traditional music, Fela Kuti, Miriam Makeba, Hugh Masekela, James Brown, Manu Dibango, Otis Redding, Jimi Hendrix, Stevie Wonder, Osibisa, and Santana.By the time she was six, Kidjo was performing with her mother's theatre troupe, giving her an early appreciation for traditional music and dance.She started singing in her school band, Les Sphinx, and found success as a teenager with her adaptation of Miriam Makeba's "Les Trois Z", which played on national radio. She recorded the album Pretty with the Cameroonian producer Ekambi Brilliant and her brother Oscar. It featured the songs "Ninive", "Gbe Agossi" and a tribute to the singer Bella Bellow, one of her role models. The success of the album allowed her to tour all over West Africa. Continuing political conflicts in Benin prevented her from being an independent artist in her own country and led her to relocate to Paris in 1983. While working various day jobs to pay for her tuition, Kidjo studied music at the CIM, a reputable jazz school in Paris where she met musician and producer Jean Hebrail, with whom she has composed most of her music and whom she married in 1987. She started out as a backup singer in local bands. In 1985, she became the front singer of the known Euro-African jazz/rock band Jasper van't Hof's Pili Pili. Three Pili Pili studio albums followed: Jakko (1987), Be In Two Minds (1988, produced by Marlon Klein) and Hotel Babo (1990). By the end of the 1980s, she had become one of the most popular live performers in Paris and recorded a solo album called Parakou for the Open Jazz Label. She was then discovered in Paris by Island Records founder Chris Blackwell, who signed her in 1991. While at Island she co-wrote the U2 song "Mysterious Ways" from their 1991 album Achtung Baby. She recorded four albums for Island until Blackwell's departure from the label. In 2000 she was signed in New York by Columbia Records, for which label she recorded two albums. Her first album for Island Records was recorded between Miami and Paris and produced by Miami Sound Machine drummer Joe Galdo and features Branford Marsalis and Manu DiBango on saxophones. It was released worldwide in 1991 and reached number one on the Billboard World Music chart. Music videos for the singles "We We" and "Batonga" were released and Kidjo made her first world tour, appearing at many festivals and headlining the Olympia Hall in Paris on October 31, 1992. Logozo is ranked number 37 in the Greatest Dance Albums of All Time list compiled by the Thump website. Released in 1994, the album Ayé was produced by David Z at Prince's Paisley Park Studio in Minneapolis and by Will Mowat at Soul To Soul studio in London. It includes the single "Agolo", which gave Kidjo her first Grammy nomination. Kidjo and Jean Hebrail traveled all over Benin in 1995 to record the traditional rhythms that would form the base for the Fifa album. Carlos Santana appears on "Naima", a piece Kidjo wrote for her daughter. The single "Wombo Lombo" and its video was a big success all over Africa in 1996. Recording: Benin, Paris (Guillaume Tell), London, Los Angeles, Sausalito Plant (Carlos Santana). In 1998, she started a trilogy of albums (Oremi, Black Ivory Soul and Oyaya) exploring the African roots of the music of the Americas. Produced by Peter Mokran and Jean Hebrail, recorded in New York, Oremi is a collection of songs mixing African and African-American influences. Cassandra Wilson, Branford Marsalis, Kelly Price and Kenny Kirkland collaborated with Kidjo on this project. The opening track is a cover of Jimi Hendrix's "Voodoo Child". In 2000, Kidjo traveled to Salvador de Bahia to start recording the Axe percussion grooves for this album, based on Afro-Brazilian culture. She worked with songwriters Carlinhos Brown and Vinicius Cantuária. On the Brazilian version of the album Gilberto Gil joined her on "Refavela" and Daniella Mercury on "Tumba". Dave Matthews appears on the song "Iwoya". Produced by Steve Berlin from Los Lobos and by the pianist Alberto Salas, released in 2004, Oyaya! mixes Latin and Caribbean music with African guitars. The French Guyanese Henri Salvador, who was 86 at the time of the recording, joined Kidjo on the song "Le Monde Comme un Bébé". Angélique Kidjo released the album Djin Djin on May 1, 2007. Many guests appear on the album including Josh Groban, Carlos Santana, Alicia Keys, Joss Stone, Peter Gabriel, Amadou and Mariam, Ziggy Marley, and Branford Marsalis. The title refers to the sound of a bell in Africa that greets each new day. The album, produced by Tony Visconti, won a Grammy for Best Contemporary World Music album and a NAACP Image Award for Outstanding World Music album. Õÿö, released in Europe on January 18, 2010 and in America on April 6, 2010, pays tribute to the music of Kidjo's childhood in Benin. It mixes traditional music, Miriam Makeba's songs, classic soul of the 1960s and 1970s and even a Bollywood song. Dianne Reeves appears on Aretha Franklin's "Baby I Love You", Bono and John Legend on Curtis Mayfield's "Move On Up", for which Kidjo recorded a video with the Fela! dancers and Roy Hargrove on Santana's Samba Pa Ti. Produced by Kidjo and Jean Hebrail, the album was arranged in conjunction with the Beninese guitarist Lionel Loueke. Õÿö was nominated for Best Contemporary World Music Album for the 53rd Grammy Awards. Spirit Rising, the live album from Kidjo's PBS Special performance, was released in North America on February 22, 2012. It features a collection of songs from her entire career played live in Boston with special guests Ezra Koenig from Vampire Weekend, Dianne Reeves, Branford Marsalis, Christian McBride and Josh Groban. She sings a version of "Redemption Song" with the Kuumba Singers. On January 28, 2014, Kidjo released a new album, EVE, dedicated to the women of Africa, to their resilience and their beauty "Eve is an album of remembrance of African women I grew up with and a testament to the pride and strength that hide behind the smile that masks everyday troubles," says Kidjo. She travelled to Kenya and Benin, from South to North and back, armed with a six track field recorder, to capture the sweet rhythmic harmonies and chants of traditional women choirs. With the contribution of the Beninese percussionists from the Gangbe Brass Band, Kidjo laid the musical foundation of the album in New York with an ensemble of top session musicians—guitarist (and fellow Benin native) Lionel Loueke, guitarist Dominic James, drummer Steve Jordan, bass great Christian McBride—under the guidance of producer Patrick Dillett, a longtime collaborator of David Byrne. Helping the singer fulfill her vision on "Eve" are a host of exciting prominent newcomers to her musical circle, including guitarist and keyboardist Rostam Batmanglij from Vampire Weekend, Nigerian Folk singer Aṣa on "Eva", legendary pianist Dr. John, who adds his New Orleans magic to "Kulumbu"; The Kronos Quartet and the Luxembourg Philharmonic Orchestra, The traditional Congolese song "Bana" features the vocals of Kidjo's mother Yvonne. The album debuted at number 1 in the Billboard World Music chart. The album EVE was rated #1 in the Top 12 of World Music albums for 2014 by Radio France Internationale. Its opening track, "M'Baamba", featured in the New York Times′ "Top 10 songs of 2014" list. EVE won the Grammy for Best World Music Album at the 57th Grammy Awards. On March 31, 2015, Kidjo released her collaboration with the Luxembourg Philharmonic Orchestra. The album contains orchestral versions of 9 songs from previous albums and two original songs: Nanae and Otishe. All the songs are arranged by Gast Waltzing and David Laborier and the orchestra is conducted by Gast Waltzing. The Australian newspaper noted: "Kidjo opens what's arguably her most ambitious album by paying homage to her heroine, Miriam Makeba. None of her three previously released versions of Malaika can match the majesty and grandeur of this latest spine-tingling rendition, which features the singer in superlative voice (in Swahili) backed by the strings and wind instruments of the 110-piece Orchestre Philharmonique du Luxembourg. Elsewhere, the consummate guitar playing of Kidjo's compatriot Lionel Loueke and Brazilian Romero Lubambo augment conductor-trumpeter Gast Waltzing's sumptuous arrangements. Sultry flute and flugelhorn helps Kidjo tease the nuances out of Carlos Santana's smouldering "Samba Pa Ti". In Fifa and Naima, swelling strings and soaring vocals follow tender a cappella intros. In Loloye, the strings flutter like a flock of flamingoes as horns ascend like eagles. Female back-up vocals lift Ominira and the previously unreleased Namae. A truly beautiful album, Sings combines the stately qualities of classical music with the coolness of jazz and the fervour of African and Brazilian rhythms.". Says Rhythms Magazine's Tony Hillier, "Sings is arguably the most ambitious and spiritually arresting album the New York-based West African singer has recorded in a long and distinguished career." The album won the Grammy Award in the Best World Music Album category. Released on June 8, 2018. Angélique Kidjo has partnered with producer Jeff Bhasker (Rihanna, Kanye West, Harry Styles, Bruno Mars, Drake, Jay-Z) to create Remain In Light - a new project that finds the Benin-born artist reclaiming rock for Africa, bringing Talking Heads' landmark 1980 album full circle. The record is a track-by-track re-imagination of the original, considered to be one of the greatest albums of the '80s and deeply influenced by music from West Africa, notably Fela Kuti's afrobeat. With her version of Remain In Light, Angélique celebrates the genius of Talking Heads, Brian Eno and the touchstones that made the original so revered and injects it with her euphoric singing, explosive percussion, horn orchestrations, and select lyrics performed in languages from her home country. Remain In Light features appearances by Ezra Koenig of Vampire Weekend, Blood Orange, Tony Allen, Antibalas Horns, Angélique's longtime guitarist Dominic James, and Magatte Sow (percussionist for the 'Black Panther' film score). Visual artist Kerry James Marshall created the album artwork. With Rachel Wenrick, Kidjo has written a memoir entitled Spirit Rising. It was published by Harper Collins on January 7, 2014. Desmond Tutu wrote the preface and Alicia Keys the foreword. On the back cover, Bill Clinton is quoted as saying: "The only thing bigger than Angélique Kidjo's voice is her heart. In this evocative memoir, Kidjo chronicles an inspiring life of music and activism, and raises a passionate call for freedom, dignity, and the rights of people everywhere." January 17, 2014, saw the premiere of IFÉ: Three Yoruba songs for Angelique Kidjo and the Orchestre Philharmonique Du Luxembourg conducted by Jonathan Stockhammer at the Philharmonie hall in Luxembourg. Philip Glass wrote the orchestral music based on three creation poems in Yoruba sung by Kidjo. In the program notes, Philip Glass says: "Angelique, together we have built a bridge that no one has walked on before." The piece made its American premiere with the San Francisco Symphony to a sold out crowd in the Louise M. Davies Symphony Hall on July 10, 2015. Kidjo has been a UNICEF Goodwill Ambassador since 2002. With UNICEF, she has travelled to many countries in Africa. Reports on her visits can be found on the UNICEF site: Benin, Senegal, Ethiopia, Tanzania, Syria, Malawi, Uganda, Kenya, Sierra Leone, Zimbabwe, South Africa and Haiti. Along with Mary Louise Cohen and John R. Phillips, Kidjo founded The Batonga Foundation, which empowers some of the most vulnerable and hardest-to-reach young women and girls in Benin with the knowledge and skills they need to be agents of change in their own lives and communities. Batonga accomplishes this through locating the most the most vulnerable adolescent girls in Benin and connecting them to girl-centered safe spaces led by Beninese women. These safe spaces provide young women and girls with trainings that allow them to gain new skills in financial literacy and build social capital. She campaigned for Oxfam at the 2005 Hong Kong WTO meeting, for their Fair Trade Campaign and travelled with them in North Kenya and at the border of Darfur and Chad with a group of women leaders in 2007 and participated in the video for the In My Name Campaign with will.i.am from the Black Eyed Peas. She hosted the Mo Ibrahim Foundation's Prize for Achievement in African Leadership in Alexandria, Egypt, on November 26, 2007, and on November 15, 2008, in Dar Es Salaam, Tanzania, on November 14, 2009, and in Mauritius on November 20, 2010. She hosted the "Africa Celebrates Democracy Concert" organized by the Mo Ibrahim Foundation in Tunis on November 11, 2011, and sang at the Award Ceremony on November 12, 2011, also in Dakar on November 10, 2012, Addis Ababa in November 2013 and Accra in November 2015. Since March 2009, Kidjo has been campaigning for "Africa for women's rights". This campaign was launched by The International Federation of Human Rights (FIDH). On September 28, 2009, UNICEF and Pampers launched a campaign to eradicate Tetanus "Give The Gift Of Life" and asked Kidjo to produce the song "You Can Count On Me" to support the campaign. Each download of the song donates a vaccine to a mother or a mother-to-be. With Jessica Biel and Peter Wentz, Angélique Kidjo was a LiveEarth Ambassador for the 2010 Run For Water events. Kidjo has recorded a video based on her song "Agolo" and on the images of Yann Arthus-Bertrand for the United Nations SEAL THE DEAL Campaign to prepare for the Copenhagen Climate Change summit. The Commission of the African Union (AU) announced on July 16, 2010, the appointment of Angélique Kidjo as one of 14 Peace Ambassadors to support the implementation of the 2010 Year of Peace and Security programme. She appears in the Sudan365: Keep the Promise video to support the peace process in Darfur. In June 2010, she contributed the song "Leila" to the Enough Project and Downtown Records' Raise Hope for Congo compilation. Proceeds from the compilation fund efforts to make the protection and empowerment of Congo's women a priority, as well as inspire individuals around the world to raise their voice for peace in Congo. In 2011, Kidjo collaborated with Forró in the Dark and Brazilian Girls on the track "Aquele Abraço" for the Red Hot Organization's most recent charitable album Red Hot + Rio 2. The album is a follow-up to the 1996 Red Hot + Rio. Proceeds from the sales will be donated to raise awareness and money to fight AIDS/HIV and related health and social issues. Kidjo recorded a version of Fela Kuti's "Lady" with Questlove and Tune-Yards for the Red Hot Organization in 2012. On May 22, 2014, Kidjo met with First lady Michelle Obama to discuss international girls' education, in the Eisenhower Executive Office Building of the White House. On September 21, 2014, Kidjo was one of the endorsees of the People's Climate March. She joined the march in New York, along with Mary Robinson, and was interviewed by Amy Goodman for Democracy Now. November 2014 saw Kidjo collaborating with many other artists in Band Aid 30, the 30th-anniversary version of the 1980s supergroup. Kidjo is a contributor to the Art Of Saving A Life Campaign initiated by the Bill & Melinda Gates Foundation. On September 25, 2015, she sang Afirika at the opening of the United Nations General Assembly in New York in support of the launch of the Global Goals for Sustainable Development along with Shakira after a speech by Pope Francis and before Malala. In 1996, Angélique Kidjo performed in Oslo for the Nobel Peace Prize Concert honoring Carlos Filipe Ximenes Belo and José Ramos-Horta for their work in East Timor. IN 1998, she was part of the Sarah McLachlan's Lilith Fair tour. In 2002, she performed in Oslo for the Nobel Peace Prize Concert honoring President Jimmy Carter. In February 2003, she performed a cover of Jimi Hendrix's "Voodoo Child (Slight Return)" at the famed Radio City Music Hall in New York City alongside Chicago blues guitar legend Buddy Guy and New York rock guitarist Vernon Reid (of Living Colour) in what would become part of Lightning In A Bottle: One Night In The History Of The Blues, a documentary about blues music that features live concert footage of other rock, rap, and blues greats. In November 2003, she sang with Peter Gabriel and Youssou N'Dour at the Cape Town 46664 concert for Nelson Mandela's Foundation. In May 2004, she performed at the Quincy Jones-produced concert in Rome called "We Are The Future" in front of 400,000 people. The show took place at the Circus Maximus with appearances by Oprah Winfrey, Alicia Keys, Andrea Bocelli, Herbie Hancock and other international stars. In 2005, Kidjo appeared at the Africa Unite Live concert in Addis Ababa, Ethiopia, a concert to celebrate the Honourable Bob Marley's 60th birthday, and was a featured speaker at the conference of African Unity held along with the concert. In March 2005, she appeared at the Africa Live concert in Dakar along with many great African stars in front of 50,000 people. In June 2005, she was part of the Live 8 concert, Eden Project hosted by Angelina Jolie in Cornwall, UK. In 2007, she covered John Lennon's "Happy Christmas (War Is Over)" for the CD Instant Karma: The Amnesty International Campaign to Save Darfur. In 2007, she toured North America extensively with Josh Groban's "Awake" show. On July 7, 2007, Kidjo performed at the South African leg of Live Earth. Annie Lennox has joined forces with Kidjo and 22 other female artists to raise the awareness of the transmission of HIV to unborn children in Africa. Kidjo was also a judge for the 7th annual Independent Music Awards to support independent artists' careers. Kidjo performed at the 75th Birthday Celebration of Quincy Jones at the Montreux Jazz Festival in July 2008. She made her Carnegie Hall debut in New York on November 1, 2008. Her Royal Albert Hall debut in London was on November 26, 2008, along with Hugh Masekela for the "African Stars" concert benefitting VSO. She appears on the "Price of Silence" video produced by Amnesty International to celebrate the 60 years of the Declaration of Human Rights. Along with Joan Baez, Michael Franti and Jackson Browne, she performed at Peace Ball for Barack Obama's inauguration in Washington, DC, on January 20, 2009. Kidjo made her Sydney Opera House debut in Australia on April 12, 2009. Kidjo appeared in the theatrical performance of Storie fantastiche dal delta del Niger by Raffaele Curi for the Alda Fendi Experimenti Foundation in Rome in April 2009. Also in April 2009, Kidjo performed at Africa Day in The Hague, Netherlands, showing her commitment to poverty reduction and supporting the work of the Evert Vermeer Foundation and SNV Netherlands Development Organisation. Kidjo commented, "In the fight against poverty you need organisations like SNV and the Evert Vermeer Foundation. SNV with expertise on the ground and EVF convincing politicians to do more on sustainable development." In July 2009, Kidjo became a member of the SNV Netherlands Development Organisation International Advisory Board. In Europe in July 2009, together with Dianne Reeves, Lizz Wright and Simone, Kidjo was part of a touring tribute to Nina Simone called "Sing The Truth". In July 2009 she sang a duet with Alicia Keys at Radio City Hall in New York for the 46664 concert for Nelson Mandela's Foundation. On August 28, 29 and 30, 2009, she participated to the Back2Black Festival devoted to African culture in Rio de Janeiro along with Gilberto Gil, Youssou N'Dour and Omara Portuondo. On September 25, 26 and 27, 2009, the Festival D'Ile De France in Paris asked Kidjo to curate a tribute to her idol Miriam Makeba at the Cirque d'hiver. She invited Rokia Traoré, Dobet Gnahoré, Sayon Bamba Camara, Vusi Mahlasela, Asa and Ayo. Kidjo curated another version of the same show at the Barbican in London on November 21, 2009, with Baaba Maal replacing Rokia Traoré. On October 23, 2009, she sang at the United Nations General Assembly for the UN Day Concert, A Tribute to Peacekeeping with Nile Rodgers, John McLaughlin and Lang Lang. On December 4, 2009, in Cape Town, South Africa, she performed her song "Agolo" at the Final Draw of the Fifa World Cup 2010. On December 7, 2009, on the opening day of the UN Copenhagen Climate Change summit, Kidjo sang, along with Anggun, Shaggy, Youssou N'Dour and Cheb Khaled, at the Dance 4 Climate Change concert. On February 15, 2010, Kidjo performed in Vancouver for the Winter Olympic Games at the Place De La Francophonie. On February 28, 2010, she performed at the Walt Disney Concert Hall, the Los Angeles Philharmonic concert hall designed by Frank Gehry. On June 10, 2010, she was part of the Official Kick-Off Celebration Concert of the 2010 FIFA World Cup South Africa, along with John Legend, Hugh Masekela, Shakira, Alicia Keys, Juanes and Black Eyed Peas. On June 17, 2010, she performed at Les FrancoFolies de Montréal – the Montreal Francofolies festival of French-language music. On August 30, 2010, Kidjo sang at the 30th Anniversary celebration of Solidarnosc in the Polish city of Gdańsk produced by Bob Wilson and Hal Willner featuring Philip Glass, Marianne Faithfull, Rufus Wainwright and Macy Gray. On November 11, 2010, Kidjo presented her "Sound Of The Drum" show at Carnegie Hall. The sold-out concert featured special guests Youssou N'Dour, Omara Portuondo, Dianne Reeves and guitarist Romero Lubambo and told the story of the African roots of the music of the diaspora. From December 10 until December 19, 2010, Kidjo participated to the Fesman 2010, the World Festival of Black Arts in Dakar, Senegal. The Festival is the third edition of a festival devoted to the African culture all over the world. On June 8, 2011, Kidjo performed her most famous songs with the Luxembourg Philharmonic Orchestra at the Philharmonie Luxembourg Hall. On October 1, 2011, she created a special concert based on Beninese traditional songs with guest guitarist Lionel Loueke for the "Heroic Africans" exhibition at the Metropolitan Museum of New York. On October 27, 2011, Kidjo performed at the Doha Tribeca Film Festival in Qatar, following the screening of Mama Africa, a documentary about Miriam Makeba's life. On December 10, 2011, Kidjo sang "Malaika" in Oslo at the Nobel Peace Prize ceremony honoring Ellen Johnson Sirleaf, Leymah Gbowee and Tawakul Karman. Kidjo also performed at the Nobel Peace Prize Concert the next day along with Janelle Monáe, Evanescence, Sugarland, Jill Scott and many others. The event was hosted by Helen Mirren and Rosario Dawson. On February 28, 2012, Kidjo created, together with the Italian Mission, a special concert called "Raise your Voice to End Female Genital Mutilation" at the United Nations General Assembly Hall in New York City. On April 30, 2012, Kidjo was part of the International Jazz Day organized by UNESCO at the United Nations General Assembly Hall in New York City, with Herbie Hancock, Terrence Blanchard, Ron Carter, Wayne Shorter, Tony Bennett, Shaka Khan, Stevie Wonder, Hugh Masekela and many others. Kidjo sang "Blewu", "Redemption Song" and "Toast to Freedom" at the "Electric Burma" concert in Dublin on June 18, 2012, honoring Aung San Suu Kyi. The concert was organized by Amnesty International and also featured Bono, Damien Rice, Vanessa Redgrave and many others. On July 21, 2012, Kidjo performed with Baaba Maal, Hugh Masekela and King Sunny Ade on the African stage of the BT River of Music Festival organized for the 2012 London Olympic Games. On October 9, 2012, Kidjo sang for the One World Concert in Syracuse, NY, honoring the Dalai Lama. The Concert was organized by the Syracuse University and featured also Dave Matthews, Swizz Beatz, Natasha Bedingfield, David Crosby, Counting Crows, Roberta Flack, Nelly Furtado, A. R. Rahman. Phil Ramone served as music producer and Whoopi Goldberg as MC. Kidjo sang "Move On Up" and also "True Colors" as a duet with Cyndi Lauper. On December 6, 2012, Kidjo joined the Alicia Keys's Keep A Child Alive Black Ball in Harlem at the Apollo Theatre along with Jennifer Hudson, Bonnie Raitt and Brittany Howard. Oprah Winfrey and Angelique Kidjo were honored for their humanitarian work at the ceremony. She sang "Pata Pata", "Afirika" and "Djin Djin" as a duet with Alicia Keys. On March 8, 2013, International Women's day, Kidjo performed along with Fatoumata Diawara at the Royal Festival Hall in London for the Women Of The World Festival organized by the SouthBank Centre. On September 13, 2013, Kidjo sang at the legendary Rock in Rio Festival with the rock band Living Color. On May 14, 2014, Kidjo sang at the famous Brazilian music award show "Prêmio da Música Brasileira" at the Teatro Municipal in Rio de Janeiro. On May 29, 2014, Kidjo sang with Brazilian singer Lenine and Portuguese guitar player Rui Veloso for the opening concert of The Rolling Stones at Rock In Rio Lisboa. On November 5, 2014, Kidjo presented her "Mama Africa" tribute concert to Miriam Makeba at Carnegie Hall. The sold-out concert featured special guests Laura Mvula, Ezra Koenig and Vusi Mahlasela and was introduced by Whoopi Goldberg. On July 10, 2015, Kidjo sang with the San Francisco Symphony at the Louise M. Davies Symphony Hall. The program included Gershwin's Summertime, IFÉ, her collaboration with Philip Glass and some songs from her album SINGS. October 3, 2015 saw the French sold out premiere of IFÉ, Three Yoruba songs, Kidjo's collaboration with Philip Glass at the new prestigious Philharmonie De Paris with the Orchestre Lamoureux conducted by Gast Waltzing. On November 5, 2015, the David Lynch Foundation organised another benefit concert at New York City's Carnegie Hall named "Change Begins Within" to promote transcendental meditation for stress control. Kidjo participated, as did Katy Perry, Sting, Jerry Seinfeld, Jim James and classical guitarist Sharon Isbin. Each of the performers actively practices transcendental meditation. On July 10, 2016, Kidjo created the premiere of her "African Women All-Stars" concert at the Montreux Jazz Festival with special guests Aṣa, Dobet Gnaore, Lura and the Trio Teriba from Benin. On Sept 24, 2016, Angelique Kidjo performed at the opening ceremony of the National Museum of African American Culture and History in Washington appearing along with Patti Labelle, Angela Basset, Robert De Niro, Will Smith, Oprah Winfrey, Barack Obama, Michelle Obama and John Lewis. On May 5, 2017, Kidjo presented her "Remain In Light" concert at Carnegie Hall. Her sold out performance was a reinvention of the iconic album by the rock band Talking Heads. The concert included special guest Nona Hendryx, Lionel Loueke, Antibalas, Jason Lindner and an unplanned duet with David Byrne on the song "Once In A Lifetime". Kidjo married French musician and producer Jean Hébrail in 1987. Their daughter Naima was born on March 29, 1993. In 2009, Angélique Kidjo released a version of "Redemption Song" on the compilation album Oh Happy Day: An All-Star Music Celebration. Kidjo is one of the contributors of the MOMA (Museum Of Modern Art of New York) project called "Design and Violence"
She was interviewed by David Frost for Al Jazeera in 2008 and Christiane Amanpour for CNN in 2009, 2012 and 2014. She was the host of the Tavis Smiley Show on PBS in March 2010 and February 2014 and Late Night with Jimmy Fallon in July 2010. On December 27, 2014, in Lagos, Nigeria, Kidjo won two All African Music Awards (AFRIMA): one for Best Contemporary Artist, one for Best Female Singer from West Africa. On January 28, 2015, Kidjo was awarded the Visionary Leadership Award by the International Festival of Arts and Ideas in New Haven, Connecticut. Grammy Award for Best Contemporary World Music Album, on February 8, 2015; Kidjo won her second Grammy Award for "Eve," a tribute to the continent's women. On May 6, 2015, Kidjo was awarded the David Rockefeller Bridging Leadership Award in New York by Synergos. Past recipients include Kofi Annan, Nelson Mandela, Bill Clinton, Jennifer and Peter Buffett, Mo Ibrahim. On Oct 6th, 2015, Kidjo was awarded the Impact Award by the Population Council organization along with Elisabeth J McCormack. Grammy Award for Best Contemporary World Music Album, on Feb 15th, 2016; Kidjo won her third Grammy Award for her 2015 album, Sings. On June 23, 2016, Kidjo was awarded the title of Officer of the Order of Merit of the Grand Duchy of Luxembourg by Luxembourg Prime Minister Xavier Bettel. On July 15, 2017, Angelique has received the Award for Best Actress in a Supporting Role from the African Movie Academy Awards for her role in Kunle Afolayan's movie, The CEO. On June 14, 2018, Angelique received the Prix De L'Artiste Citoyen 2018 from the Adami [fr], the French society of performers. On October 21, 2018, Angelique Kidjo received the first World Pioneer Award during the Songlines Magazine Music Awards 2018 ceremony at Electric Brixton in London. She sung a duet with Fatoumata Diawara backed by Mokoomba during the finale of the evening. Kidjo's Grammy nominations include the Best Music Video of 1995 and Best World Music Album for works completed in 1999, 2003, 2005, 2007, 2010, 2014 and 2015. Angélique Kidjo is the 4th laureate of the Antonio Carlos Jobim Award (2007). Created in 2004 on the 25th anniversary of the Festival International de Jazz de Montréal, each year the award is given to an artist distinguished in the field of world music whose influence on the evolution of jazz and cultural crossover is widely recognized. Angélique's music has been remixed by famous producers including Norman Cook ("We We") and Tricky ("Agolo"). Several of her singles have reached the Billboard Dance/Club Play chart. In 1996, Junior Vasquez remixes of her song "Wombo Lombo" brought the song to Number 16. In 2002, King Britt remixes of her single "Tumba" helped the song reach Number 26. "Agolo" was remixed by Mark Kinchen, "Shango" was remixed by Junior Vasquez, and "Conga Habanera" was remixed by Jez Colin. "Salala" from, Djin Djin, was remixed in 2007 by Junior Vasquez and Radioactive Sandwich.. "Move On Up" was remixed by Radioclit, the team from the Very Best. ^ a b "Africa | Time for Peace". Africatimeforpeace.com. Archived from the original on 2012-03-31. Retrieved 2012-04-03. ^ a b "Albums by Angélique Kidjo". Rate Your Music. Retrieved 2012-04-03. ^ Perry, Alex (May 23, 2007). "Redemption Song". Time. ^ "Focus On Africa Magazine | Forum: Who is your African Icon?". BBC. Retrieved 2012-04-03. ^ Khaleeli, Homa (March 8, 2011). "Angélique Kidjo". The Guardian. London. ^ Nsehe, Mfonobong. "Angelique Kidjo, 51, Beninoise, Musician – In Photos: The 40 Most Powerful Celebrities In Africa". Forbes. Retrieved 2014-02-18. ^ McNulty, Bernadette (July 13, 2012). "BT River of Music: Angélique Kidjo interview for London 2012". Telegraph. Retrieved 2014-02-18. ^ "African Diva Kidjo Empowered By 'Bad Religion'". NPR. 2013-03-13. Retrieved 2014-02-18. ^ "2014 Most Influential Africans – Arts & Culture", New African, December 22, 2014. ^ HaNiakaté (12 January 2015). "Bénin – Bénin : Angélique Kidjo, diva engagée – Jeuneafrique.com – le premier site d'information et d'actualité sur l'Afrique". JEUNEAFRIQUE.COM. Retrieved 26 April 2015. ^ "Angelique Kidjo | Listen and Stream Free Music, Albums, New Releases, Photos, Videos". Myspace.com. Retrieved 2014-02-18. ^ Kidjo, Angelique (November 30, 2012). "Songs of Freedom". The New York Times. Retrieved 2014-02-18. ^ Kidjo, Angélique (August 13, 2010). "Daughter of Independence". The New York Times. Retrieved 2014-02-18. ^ "Don't Let Ebola Dehumanize Africa", The New York Times, October 30, 2014. ^ a b "Yale awards nine honorary degrees at Commencement 2015". YaleNews. 2015-05-15. Retrieved 2018-02-09. ^ "Berklee 2010 Honorary Doctorates | Stan Getz Library". Library.berklee.edu. Retrieved 2018-02-09. ^ "Middlebury Celebrates Commencement". Middlebury. 2014-05-25. Retrieved 2018-02-09. ^ "The 99 Greatest Dance Albums of All Time". Thump.vice.com. 2015-07-14. Retrieved 2016-05-16. ^ "Angélique Kidjo - Bénin | cd mp3 concert biographie news | Afrisson". Afrisson.com (in French). Retrieved 2018-07-03. ^ a b "Shigeru Ban, Andrea Bocelli, Angélique Kidjo receive Crystal Awards; Open World Economic Forum Annual Meeting in Davos". Shigeru Ban, Andrea Bocelli, Angélique Kidjo receive Crystal Awards; Open World Economic Forum Annual Meeting in Davos – World Economic Forum. Archived from the original on 8 February 2015. Retrieved 26 April 2015. ^ a b Foundation, Thomson Reuters (2016-05-04). "Angélique Kidjo honoured with Amnesty International top human rights award". The Guardian. Retrieved 2018-02-09. 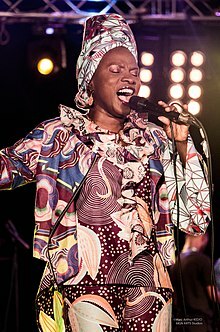 ^ "Angélique Kidjo - Biographie, discographie et fiche artiste". RFI Musique (in French). Retrieved 2018-07-03. ^ Weickgenant, Joel (March 29, 2008). "Kidjo's Music Crosses Borders, Boundaries". Savannah Morning News. NewsBank. p. 6E. Retrieved 2009-02-03. ^ "The 99 Greatest Dance Albums of All Time". Thump. 2015-07-14. Retrieved 2018-02-09. ^ "Angelique Kidjo – MOVE ON UP – with Bono and John Legend featuring the Bill T. Jones' FELA! Dancers". YouTube. Retrieved 2014-02-18. ^ "Angelique Kidjo's New Album 'Eve' Debuts At #1 On Both Billboard World Charts!" PR Newswire. ^ Jon Pareles, "Jon Pareles’s Favorite Albums and Songs of 2014", The New York Times, December 11, 2014. ^ "57th GRAMMY Awards Premiere Ceremony". The GRAMMYs. Retrieved 26 April 2015. ^ "Invigorating African funk". 2015-03-27. Retrieved 2018-02-09. ^ "ANGELIQUE KIDJO STREAM – Rhythms Music Magazine". Rhythms Music Magazine. Archived from the original on 4 April 2015. Retrieved 26 April 2015. ^ "Benin's Kidjo wins world music Grammy". BBC News. 2016-02-16. Retrieved 2018-02-09. ^ "Angelique Kidjo Gives New Life To Talking Heads' 'Remain In Light'". NPR.org. Retrieved 2018-11-13. ^ "Angélique Kidjo on the Myth of Cultural Appropriation and Covering Talking Heads' Remain in Light | Pitchfork". Pitchfork.com. Retrieved 2018-11-13. ^ Kidjo, Angelique. "Spirit Rising: My Life, My Music by Angelique Kidjo, Rachel Wenrick". Harpercollins.com. Retrieved 2014-02-18. ^ "Angélique Kidjo, l'Afrique et l'orchestre". Abonnes.lemonde.fr. 2014-01-17. Retrieved 2014-02-18. ^ "Philharmonie Luxembourg". Philharmonie.lu. 2014-01-17. Retrieved 2014-02-18. ^ a b "Kidjo/Glass: African music meets minimalism at Symphony". San Francisco Chronicle. Retrieved 2018-02-09. ^ "Half the Sky". Halftheskymovement.org. 2012-08-30. Archived from the original on 2012-10-14. Retrieved 2014-02-18. ^ "Day of solidarity with Mali at UNESCO Headquarters 18 February". United Nations Educational, Scientific and Cultural Organization. 2013-02-14. Retrieved 2014-02-18. ^ Krissah Thompson, "Michelle Obama renews her call to #Bringbackourgirls", The Washington Post, May 22, 2014. ^ Endorsements Archived 2015-08-14 at the Wayback Machine, People's Climate March. ^ "The Art of Saving a Life". Artofsavinglife.com. Retrieved 26 April 2015. ^ "UNICEF Goodwill Ambassadors Shakira and Angélique Kidjo raise their voices in support of a new development era for children". UNICEF. Retrieved 2018-02-09. ^ "Angélique Kidjo a ému les spectateurs avec la chanson "Blewu" lors des commémorations". Le Huffington Post. 11 November 2018. Retrieved 20 December 2018. ^ "World leaders mark WWI centenary in sombre Paris ceremony". RFI. 11 November 2018. Retrieved 20 December 2018. ^ "TF1 Le JT". Facebook.com. Retrieved 20 December 2018. ^ "7th Annual IMA Judges". Independent Music Awards. Archived from the original on 2014-03-06. Retrieved 2014-02-18. ^ Regina Rito, "Dueto de Péricles com a cantora Angelique Kidjo levanta o público no Municipal", O Dia, May 16, 2014. ^ Jon Pareles, "A Circle of Celebration, Forged in Africa – Angélique Kidjo’s Tribute to Miriam Makeba", The New York Times, November 6, 2014. ^ "Angélique Kidjo & Philip Glass : Ifè". Philharmonie de Paris (in French). Retrieved 2018-02-09. ^ "Le Monde.fr – Actualité à la Une". Le Monde.fr (in French). Retrieved 2018-02-09. ^ Grow, Kory. "Katy Perry, Sting Stun at David Lynch's Meditation Benefit Concert – Jerry Seinfeld, Angelique Kidjo, Jim James and others also perform and explain relaxation technique's importance to them at New York's Carnegie Hall". Rolling Stone Magazine. Retrieved November 14, 2015. ^ "PressReader.com – Connecting People Through News". Pressreader.com. Retrieved 2018-02-09. ^ "Angélique Kidjo convoque l'âme de Miriam Makeba sur le nouveau musée afro-américain". Le Monde.fr (in French). Retrieved 2018-02-09. ^ "Review: Angélique Kidjo Takes 'Remain in Light' Back to Africa". The New York Times. 2017-05-07. ISSN 0362-4331. Retrieved 2018-02-09. ^ Orshoki, Wes (June 2007). "With a little help from her friends: Angelique Kidjo finds inspiration in world class collaborators". Global Voice. pp. 31–35. ^ "Female Genital Mutilation (FGM) Awareness Poster Campaign (Amnesty International & Volontaire)". Design and Violence. 2014-10-15. Retrieved 2018-02-09. ^ "Dibi Dobo, Angélique Kidjo Singers share 'Ekomole' dance song [Video]". Pulse Nigeria. Joey Akan. Retrieved 22 June 2015. ^ "BBC Two – Later... with Jools Holland, Series 36, Episode 4". Bbc.co.uk. 2010-05-08. Retrieved 2014-02-18. ^ "NOW with Bill Moyers. Arts & Culture. Musician Angelique Kidjo". PBS. Retrieved 2014-02-18. ^ "Politically Incorrect With Bill Maher – 'Untitled' Episode Info – MSN TV". Tv.msn.com. 2002-05-15. Retrieved 2014-02-18. ^ "Second Cup Café: Angelique Kidjo". CBS News. 2002-06-28. Retrieved 2014-02-18. ^ "Abhisit Vejjajiva – Frost Over the World". Al Jazeera English. Retrieved 2014-02-18. ^ "Childhood stunting – Amanpour – CNN.com Blogs". Amanpour.blogs.cnn.com. October 16, 2012. Retrieved 2014-02-18. ^ "Video: Angelique Kidjo: Tuesday, 3/2/10 | Watch Tavis Smiley Online | PBS Video". Video.pbs.org. Archived from the original on 2014-02-22. Retrieved 2014-02-18. ^ Jon Friedman (2010-07-28). "Angelique Kidjo Featuring John Legend – Music". Late Night with Jimmy Fallon. Retrieved 2014-02-18. ^ "Nominations dans l'Ordre des Arts et Lettres – janvier 2009". Culture.gouv.fr. Retrieved 2012-04-03. ^ "Grand Prix des musique du monde – Angélique Kidjo". Sacem.fr. Retrieved 2014-02-18. ^ FrenchTwistDC (2011-03-04). "Belgium kicks off DC's Francophonie Festival". French Twist D.C. Archived from the original on 2012-03-21. Retrieved 2012-04-03. ^ "Press Releases May 2011 – UN Announces Winners of Flagship Environment Award – United Nations Environment Programme". UNEP. Retrieved 2014-02-18. ^ "Festival d'été de Québec - FEQ Awards Winners". feq.ca. Retrieved 2019-02-12. ^ France-Amérique. "Angélique Kidjo à l'honneur du Trophée des Arts 2012 du FIAF | France-Amérique". France-amerique.com. Retrieved 2014-02-18. ^ "Keep a Chils Alive's Black Ball Raises $2.9 Million" (PDF). Keepachilalive.org. Retrieved 2014-02-18. ^ Angus MacSwan (April 26, 2013). "African diva Angelique Kidjo wins Songlines Best Artist award". Reuters. Retrieved 2014-02-18. ^ "Mark Ronson To Return As Host For The Other Ball", Look to the Stars, June 3, 2014. ^ "Annual Lunch Held on October 28; Fund Honored Navi Pillay and Angélique Kidjo", Dag Hammarskjold Fund for Journalists. ^ "Canvas Black, Sounds or Tracks, Street Style, Public Spaces, Interconnecting Vibes", December 30, 2014. ^ "5th Annual Visionary Leadership Award". International Festival of Arts and Ideas. Archived from the original on 9 April 2015. Retrieved 26 April 2015. ^ "GRAMMY.com – The Official Site of Music's Biggest Night". The GRAMMYs. Retrieved 26 April 2015. ^ "De blev Årets Mappie!". M-magasin.se. Retrieved 26 April 2015. ^ "GRAMMY.com – The Official Site of Music's Biggest Night". The GRAMMYs. Retrieved 18 February 2016. ^ "Afrique: 8 Mars 2016 – Le groupe Allafrica prime 4 valeureuses femmes africaines". allAfrica.fr (in French). Retrieved 2018-02-09. ^ "Cérémonie officielle à la Philharmonie Luxembourg – Remise de distinctions honorifiques – gouvernement.lu // L'actualité du gouvernement du Luxembourg". Gouvernement.lu (in French). Retrieved 2018-02-09. ^ Izuzu, Chidumga. "Pulse Nigeria will bring you live updates of the 2017 African Movie Academy Award winners as announced". Retrieved 2018-02-09. ^ "Grand prix de l'Académie Charles Cros – 70ème palmarès – Hexagone". Hexagone (in French). 2017-11-17. Retrieved 2018-02-09. ^ "Angélique Kidjo, artiste citoyenne - Adami". Adami (in French). 2018-06-14. Retrieved 2018-11-13. ^ "Angélique Kidjo | World Pioneer Award". Songlines.co.uk. Retrieved 2018-11-13. ^ "Angélique Kidjo". Deutscher Nachhaltigkeitspreis. Retrieved 20 December 2018. Wikimedia Commons has media related to Angélique Kidjo. New York Times review of Angélique Kidjo, January 2014. CNN African Voices profile of Angélique Kidjo, May 2009. Singer Angelique Kidjo Speaks Out on Climate Change – video report by Democracy Now!. This page was last edited on 14 April 2019, at 02:31 (UTC).